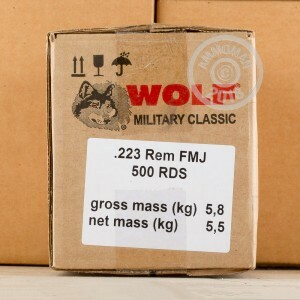 High volume AR-15 shooters will appreciate the cost savings offered by this .223 Remington ammunition from Wolf. These non-reloadable steel-cased cartridges are loaded in Russia and use non-corrosive Berdan primers. Each round in this case of 500 fires a 55 grain full metal jacket bullet at 3,130 feet per second. Note that this ammo has magnetic properties and may not be suitable for all indoor ranges. Pick up this case or any other items totaling $99 or more from AmmoMan.com for great volume savings and free shipping! As per Wolf WPA do not use this product with any Smith & Wesson M&P 15 rifles. See wolfammo.com/advisory.html for additional information. Does what it's supposed to do at a great price. 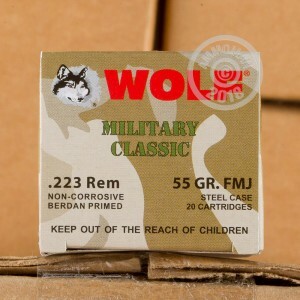 I just purchased a new DTI AR15 and 500 rounds of this 223 ammo. I've shot 250 rounds so far without a single glitch. The gun performed flawlessly with this ammo. I highly recommend it for plinking or target shooting for fun. The price is great compared to lots of ammo of the same caliber and no duds. 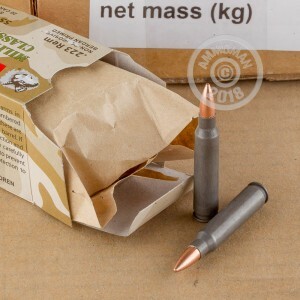 This is great range ammo, it arrived quickly and I shot about 200 rounds with no issues whatsoever, I would definitely buy it again. I just came from shooting this ammo and to me it was like shooting 5.56 brass.It was that good. I know it's metal; you have to shoot it to believe it. for plinking and Tactical Rifle and 3-gun matches. What I also like is that the empty steel cases will rust away in time and return to the Earth. Worked perfectly. My rifle liked them. Ammo was consistent with no misfires or feeding problems. These rounds are decent. Depending on what your intentions are with it. If you plan to keep these for a long time, place a silica bag or some other form of humidity absorbent in with as it is steel and is prone to rust over lo mg storage times, however if your looking for some rounds to go shooting at a buddy's Ranch or range, you can't beat it for the price grouping was good at 100 yards(indoor range). Had zero feed problems, no misfires, does run a little hot after a couple hundred rounds, and it is a bit dirty, I would avoid this ammo if you plan to stockpile and spend the extra couple bucks on brass, but if you shoot this within a year of purchase I would so no problem. Everything was shot out of a s&w m&p 15 sport 2 with zero internal modifications,clean your firearm after a day at the range or out on the hunt and you'll never have problems with dirty ammo. Great rounds hope they never run out. They work well with my M&P AR 15 I can't wait to shoot some more. Product arrived quickly and was as expected. The shipping time was outstanding! I ordered at 4 am on the 21st and received my order on the 22nd! And it was free! That is just unbelievable. I'm not sure of the ammo yet. Never shot this load before but I have heard really good reviews. I'm sure it will do great. Thanks Ammoman! I found this product on 3 websites cheaper then I paid. That is the lack of shopping and trusting the first website I view. These rounds work great in my ar15 m&p sport 2. Great price and shipping is fast right to your front door. Ammoman is the best place for your ammo.